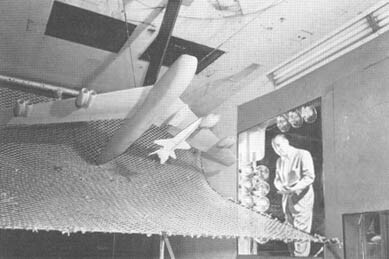 Though there was early debate inside the NACA and elsewhere about whether ballistic missiles would ever amount to much in a military sense, the psychological effect of news of Germany's technically astounding V-2s falling on English civilians, and the fear of the same thing happening to people in the United States, made it urgent that the American aeronautics establishment explore the awesome potential of the new technology. Langley laboratory responded in 1944 and 1945 by setting up three new groups to study the problems of guided missiles and rockets: (1) the Special Flying Weapons Team, (2) the Auxiliary Flight Research Station at Wallops Island, to provide free-flight data from rocket-propelled test models (in 1946, this station became nerve center of Langley's Pilotless Aircraft Research Division, or PARD), and (3) a new supersonics branch, to explore the many new compressible-flow problems brought to light by early design studies of supersonic aircraft. By 1945 it had become usual in discussing compressible flows to subdivide the fields into subsonic, transonic, and supersonic regimes. These divisions were logically derived from the type of differential equation that described each regime. Experimental research in compressible flows followed such division naturally, not only because experimenters furnished the physical guidance for theoretical development, but also because in this particular field the principal experimental tool, the wind tunnel, had major limitations in the transonic regime. There was no such clear-cut division yet between the supersonic and hypersonic ranges of flight. Generally speaking, aerodynamicists considered speeds above Mach 5 as hypersonic, since this was the supersonic speed at which aerodynamic heating seemed to become vitally important in aircraft design. Nor was there a clear-cut division between the experimental technologies of supersonic and hypersonic aerodynamics. Though it was clear to everyone by 1945 that subsonic and supersonic wind tunnels had to be designed very differently,* no one was yet sure whether supersonic and hypersonic tunnels could be designed similarly. John V. Becker and his 11-inch hypersonic tunnel. The first successful run of the small facility, which was built in the shop of the old Propeller Research Tunnel, was in November 1947. ....American tunnels would "be used, to a large extent, to develop supersonic missiles and projectiles of types which [had] already been operated at Mach numbers as high as 5.0," it appeared to Becker that there was "a definite need" for equipment capable of hypersonic test Mach numbers. Experience with the 11-inch tunnel suggested to Langley engineers that hypersonic tunnels using the intermittent blowdown scheme were preferable to the continuous-flow type tunnel, which, because of the necessary compressor equipment, would be extremely costly.7 With sophisticated recording instruments, short-duration test runs were sufficient. The 11-inch tunnel would itself achieve a remarkable record. Built as a pilot model for Becker's planned larger hypersonic tunnel-which was built some fifteen years later as the Continuous-Flow Hypersonic Tunnel-it operated for twenty-five years until 1973 when it was finally dismantled and given to the Virginia Polytechnic Institute in Blacksburg, Virginia, for educational uses. At least 230 publications resulted from tests and related analyses in the 11-inch tunnel-or about one paper every five weeks for the twenty-five years. Few major wind tunnels designed for data production can equal this record. Though the 11-inch tunnel was a great success, Langley management knew that there were too many basic aerodynamic, heating, and fluid-mechanical problems present in the hypersonic speed range to attack them all systematically in the single research facility. In 1947 John Stack proposed the design of an additional hypersonic facility that was radically different. Stack's idea was to use a single large spherical vessel (some hundred feet in diameter) with an array of blowdown jets located underneath. On demand, hot pressurized air could be parceled out in short bursts from this central source to individual test cells of small size (20 inches in diameter).8 Different teams of Langley researchers could then conduct diverse experiments without tying down a tunnel for days or weeks. The first priority of hypersonics research at Langley in the late 1940s and early 1950s was to solve the major problems of the various long-range missiles then being developed by the American military and its contractors. 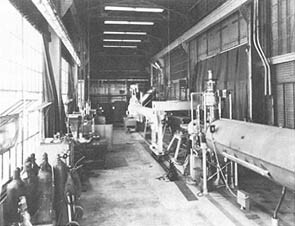 In the Gas Dynamics Laboratory, completed in 1951, researchers explored basic aerodynamic, heating, and fluid-mechanical problems in the speed range from Mach 1.5 to Mach 8.0. Long-range missile development challenged NACA researchers in a number of ways. A successful intercontinental ballistic missile would have to be accelerated to a speed of 15,000 miles per hour at an altitude of perhaps 500 miles and then guided to a precise target thousands of miles away. Sophisticated and reliable propulsion, control, and guidance systems were thus essential, as was the reduction of the structural weight of the missile to a minimum. Moreover, some method had to be found to handle the new and complicated technical problem of aerodynamic heating. As one of these nuclear-weapons carriers arched over and slammed back into Earth's atmosphere, the air around its nose - which carried the warhead - heated up to tens of thousands of degrees, hotter than the surface of the sun. The part of this heat generated outside the boundary-layer surface by shock-wave compression, and which was not in contact with the missile structure, dissipated harmlessly into the surrounding air; but the part that arose within the boundary layer, and which was in contact with the missile structure, was great enough to melt the missile. Many dummy warheads burned up because they were unprotected from the effects of aerodynamic heating. In 1951 H. Julian "Harvey" Allen, chief of high-speed research at the NACA 's Ames laboratory, predicted that the aerodynamic heating problems of certain missiles and reentry vehicles could be avoided by changing their nose shapes from sharp to blunt. The June 1952 recommendation by the NACA Aerodynamics Committee to accelerate exploratory hypersonics investigations "had little immediate effect on existing Langley programs, with the exception that it inspired the PARD to evaluate the possibilities of increasing the speeds of their test rockets up to Mach 10.17 But the recommendation did have one very important consequence for the future. In the final paragraph of the  recommendation, the NACA called for its laboratories "to devote a modest effort" to the study of the speed range beyond Mach 10 to the speeds of space flight. Langley had asked Brown, Zimmerman, and O'Sullivan to assess hypersonic problems and to develop research program ideas, but the trio chose to go further. After reviewing the potentialities of hypersonic systems at speeds up to orbital, the three researchers - all of whom had read the Woods-Dornberger documents - had become especially interested in defining a manned research airplane capable of penetrating the hypersonic flight regime, as well as in the commercial possibilities of that type of plane for long-range transport. The hypersonic airplane would be designed to fly to the limits of the atmosphere, then be boosted by rockets into space, returning to Earth by gliding under aerodynamic control. Rand and Convair had by this time done some preliminary studies of "boost-glide" rockets in connection with their development of ICBMs;19 however, the scheme of the Brown group to incorporate such a system into an experimental airplane was one that no one had yet explored. 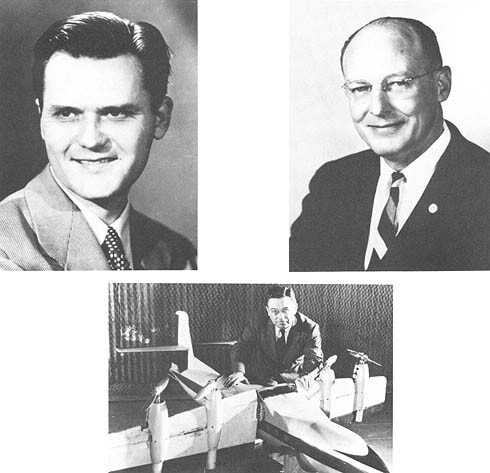 The Brown hypersonic study group of 1952: Clinton E. Brown (top left) had worked with Eastman Jacobs during World War II on the Campini jet propulsion system and with Macon C. Ellis, Jr., in the Model Supersonic Tunnel studying the feasibility of the supersonic ramjet. Langley had recently named him head of the supersonic aerodynamics section in the Gas Dynamics Branch. Charles H. Zimmerman (center) had supervised tests during the mid-1930s in Langley's spin tunnel and had designed the lab's first free-flight tunnel. In 1957 he moved to a job with Chance Vought, where he was in charge of developing the F5U short-takeoff-and-landing (or STOL) aircraft. Zimmerman returned to Langley in 1948. The field of his greatest aerodynamic expertise was the stability of radically new and different aircraft. William J. O'Sullivan, Jr., (right) had worked at Langley since 1938. In the early days on Wallops Island, he had taken on the job of developing PARD's rocket motor capabilities and rocket firing procedures. Here, again, was a case at Langley of free-flight versus wind tunnel advocacy, similar to the debate that occurred in 1944 and 1945 over Gilruth's development of the controversial wing-flow technique. Ground facilities could not simulate the high-temperature environment of flight at very high Mach numbers, admitted the hypersonics specialists, but wind tunnels like the pilot 11-inch facility at Langley and the 10 x 14-inch continuous-flow facility at Ames had proved quite capable of "partial simulation. "23 Selective flight testing of the final article was desirable-just as it always had been-but, for the sake of safety, economy, and systematic parametric investigation of details, the hypersonics specialists argued, ground-based techniques must remain the primary tools of aerodynamic research. David G. Stone's proposed modifications to the Bell X-2 for flight into space, May 1952. .....supersonic airplane which would launch, at Mach 3, a small manned second-stage vehicle to accelerate to hypersonic speeds.24 At Langley, responsibility for evaluating these papers was given to David G. Stone, head of PARD's Stability and Control Branch. Within a few months Stone also submitted an unsolicited proposal for a hypersonic test vehicle. His idea was to equip the Bell X-2 research airplane with reaction controls and add two droppable solid rocket motors as boosters.25 With such booster rockets, Stone claimed, an air-launched X-2 could be flown at a speed of about Mach 4.5 to orbital altitude. Before formally submitting the findings of their study group to the NACA in July 1953, Brown, Zimmerman, and O'Sullivan had carefully examined Stone's research airplane proposal as well as the one from the HSFS for a supersonic carrier. The three men concluded that the Stone proposal was the more practical, and they endorsed it for further engineering study. This study proceeded rather leisurely for the next several months until October 1953, when the Aircraft Panel of the Air Force Scientific Advisory Board, of which Langley's Robert Gilruth was a member, pronounced that "the time was ripe" for looking into the feasibility of procuring a manned hypersonic research airplane. Langley's ad hoc hypersonic aircraft study group consisted of John V. Becker, chairman, chief of the Compressibility Research Division and principal designer of the lab's pilot 11-inch hypersonic tunnel; Maxime A. Faget, a specialist in rocket propulsion from the Performance Aerodynamics Branch of PARD; Thomas A. Toll, a configuration and control specialist from the Stability Research Division; Norris F. Dow, a "hot structures" expert from the Structures Research Division; and James B. Whitten, test pilot. Unlike the Brown study group, this group obviously included some researchers with previous experience in hypersonics. Preliminary design configuration for a hypersonic research airplane by Becker's pre-X-15 study group, April 1954. Throughout 1954 the heating problems of high-lift, high-drag reentry earned more and more consideration from key Langley researchers. Another problem outweighed the heating consideration, however: making the configuration stable and controllable in the necessary high-angle-of-attack reentry attitude (which was 11 to 26 degrees above horizontal, meaning that the descending craft's nose would be pointing upward by that amount). In the first stage of its design study, Becker's group came up with a vehicle concept that was really "little more than an object of about the right general proportions and the right propulsive characteristics to achieve hypersonic performance. "37 The planners did not know the exact hypersonic and control properties of such an arrangement; no one in aeronautics knew. Nor did anyone else know, for that matter, whether a structure could even be found that could survive the anticipated air temperatures (estimated at approximately 4000 degrees Fahrenheit) affecting a winged vehicle during reentry. On the other hand, everyone did know that before the NACA would propose the procurement of a radical new research aircraft, it had to have solid answers to the stability and control question. Up to this point in 1954, the history of Langley's work to develop the concept of a hypersonic research vehicle primarily demonstrated one thing: the need for flexibility. Since inception, the Brown and Becker groups had run into one major technical problem after another in the pursuit of a hypersonic aircraft capable of a "space leap." Conventional wisdom had provided experimental and theoretical guidelines for preliminary design of the configuration, but had fallen far short of giving final answers. The conventional wisdom of transonic and supersonic aircraft design had dictated that a horizontal tail surface be located far above or well below the wing plane, for example, but that wisdom was apparently wrong for hypersonic conditions. Ballistics experts committed to sharp-nosed missiles had continued to doubt the worth of Allen's blunt-body principle, but they too were wrong. Conversely, the instincts of Floyd Thompson, who knew very little about hypersonics but who was a 30-year veteran of the ups and downs of aeronautical research, had been sound. The design and research requirements of a hypersonic vehicle which could possibly fly into space were so radically new and different, Thompson had suggested, that only "fresh approaches" could meet them. By the end of June 1954, after three months of long and pressured work days, the Becker group reached a stage where it felt it could make a convincing case for the feasibility of a Mach 7 research aircraft. Those at NACA headquarters who followed the progress of their work, as well as of the parallel work on hypersonic aircraft concepts being done at the other NACA centers, agreed. It was time for the military to listen to a unified NACA presentation. Representatives of the navy and the Scientific Advisory Board of the air force assembled at NACA headquarters on 9 July 1954 for what became  the first of many presentations on the possible new research vehicle. Hugh Dryden opened the meeting by outlining why he thought a hypersonic aircraft was now desirable. Hartley Soulé, chairman of the NACA's Research Airplane Panel, then reviewed the history of the cooperative research airplane programs in the most favorable terms possible, and Walter Williams, chief of the High-Speed Flight Station, summarized recent activities at Edwards Air Force Base. 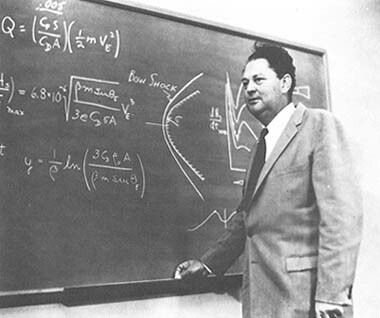 When Soulé and Williams finished, Becker and John E. Duberg - chief of the Structures Division, who was substituting for N. F. Dow - presented the results of the Langley study. The meeting concluded with agreement that the NACA should circulate a document setting forth the proposed details of a Mach 7 airplane to appropriate parties in the military and industry.42 Three months later, on 5 October, the NACA Aerodynamics Committee met in executive session at the High-Speed Flight Station. (It had met in regular session the day before at the Ames lab, Moffett Field, California.) The purpose of the executive session was to come to some final decision about the desirability of a manned hypersonic research airplane. Walter Williams and HSFS test pilot A. Scott Crossfield followed Thompson's introduction with an outline of the performance required for a new research airplane and a discussion of some of the more important operational aspects of the plane. At that point Becker and N. F. Dow took over with a detailed presentation of their group's intensive six-month study. Lively debate followed this presentation. Most members of the Aerodynamics Committee strongly supported the idea of the hypersonic research airplane. This group included Robert J. 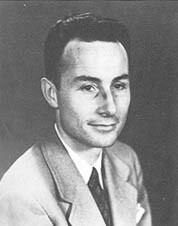 Woods, Bell's representative on the committee, who in the summer of 1954 had led one of the first industry teams to Langley to find out about the concept of the Becker group, and Clark B. Millikan of the California Institute of Technology, who emphasized the importance of obtaining flight experience, especially about the effects of the "no-gravity" condition on the pilot. 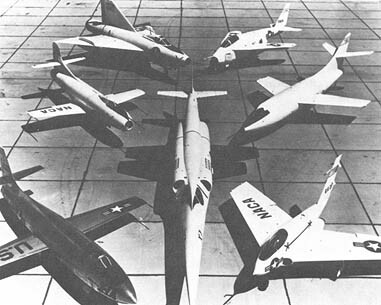 NACA research contributed significantly to the development of the seven most important experimental aircraft designs o[ the 1950s. Parked (clockwise, from lower left) on the checkered tarmac at Edwards Air Force Base in California are: the Bell X-1A, the Douglas D-558-1, the delta-winged Convair XF-92, the Bell X-5 (the first aircraft to use a variable-sweep wing), the Douglas D-558-2, the Northrop X-4 (with no horizontal tail surface), and (in the center) the dart-shaped Douglas X-3. BE IT HEREBY RESOLVED, That the Aerodynamics Committee hereby endorses the proposal of the immediate initiation of a project to design and construct a research airplane capable of achieving speeds of the order of Mach number 7 and altitudes of several hundred thousand feet for the exploration of the problems of stability and control of manned aircraft and aerodynamic heating in the severe form associated with flight at extreme speeds and altitudes. With a strongly worded endorsement of the proposal from his prestigious Aerodynamics Committee in hand, Hugh Dryden immediately conferred with air force and navy management on how best to move toward procurement. Quickly the three parties agreed that detailed technical specifications of the proposed aircraft, with a section outlining Langley's plan, should be produced mutually by the end of the year for formal presentation to the Air Technical Advisory Panel of the Department of Defense. The aerodynamics of air launching the North American X-15 being investigated in the High-Speed 7 x 10-Foot tunnel, about 1957. .....30 December, the Air Materiel Command invited aircraft manufacturers to a bidders' briefing to be held at Wright-Patterson Air Force Base on 18 January 1955. At this briefing the NACA and the military informed potential contractors of the design and operational requirements of the hypersonic airplane. Attitude control simulator for X-15 studies at Langley, 1958.
at this speed boost gliders approached their peak heating environment. The rapidly increasing flight altitudes at speeds above Mach 18 caused a reduction in heating rates; at satellite speed, of course, on the outer fringe of the atmosphere, the heating rates became negligible. In 1957 Langley tested its HYWARDS design in the 11-inch hypersonic tunnel. ....(or lee) side of the wing. The flat-bottomed wing design had "the least possible critical heating area for a given wing loading," which translated into the need for "least circulating coolant, least area of radiative shields, and least total thermal protection in flight." 53 Here was the first clear delineation by the NACA or anyone else of design features that could significantly alleviate the aerodynamic heating problems of hypersonic flight, "space leap," and reentry. In the future, designers would incorporate these basic features in the air force's Dyna-Soar (a program whose intent was to combine all post-1953 feasibility studies on a boost-glide research vehicle into a single plan) and NASA's space shuttle. In the course of supporting HYWARDS, Becker's study group became engaged in a debate with a parallel group of researchers at Ames. A glimpse of this debate reveals specialists inside one overall organization arriving at different solutions to the same technical problem, and management mediating the consequent disagreements and rivalries. Results of the debate show how and why it is sometimes beneficial for two laboratories to work simultaneously but separately on the same problem. Resolving the debate between the Ames and Langley study groups was up to NACA management at the two labs and in Washington. In the  interests of interlaboratory peace and cooperation, all three units opted for compromise. The HYWARDS team at Langley wrote a report for headquarters, for example, analyzing both the Langley and Ames vehicles in positive terms as essentially the results of alternative approaches: "low heating" (Langley's) and "high L/D" (Ames's). Langley management and an officer in headquarters edited the report for impartiality, while Becker and members of his HYWARDS study group summarized its contents in presentations at Langley, at Ames, and at headquarters in May 1957, and at the Pentagon in July. Because of strong residual differences over how to configure HYWARDS, the NACA held an interlaboratory Round III meeting at Ames from 16 to 18 October 1957. Both working-level personnel and upper management attended. Again, compromise was the order of the day. The Langley and Ames study groups were ready to agree that it was "foolish" to be so "vociferously wedded" to present configurations. Each side knew that its own configuration fell far short of optimum. For its part, the Langley team recognized that it had simply selected "reasonable but arbitrary" values for some vital design factors. For example, it had originally determined the coolant requirements by merely assuming a particular wing loading and skin temperature. ******** The Langley team also now revealed that the complex internal coolant system it had planned for its glider configuration was "a highly undesirable complication," made necessary by the lack of a superior high-temperature material (which the Langley structures people dubbed "unobtainium" )58 Considering the fact that the aircraft system it recommended would require new developments in every area of applicable technology, the team's forecast that the system could be developed and ready for flight in five years or less was far too optimistic. During his summary presentation at Round III on 16 October, Becker made exactly these points, if in a way that still meant to show the errors of the Ames high-L/D approach. To do so, he predicted certain dramatic effects on the performance of the Langley glider that would result from  reductions in wing size and wing loading. He demonstrated that by using a wing that was 40 percent smaller, the range of the glider would be increased from 4700 to 5600 nautical miles. Decreasing the size of the wing also reduced the L/D by about 14 percent, but Becker emphasized that the associated 4000-pound reduction in glider weight more than compensated for this L/D loss. The head of Langley's pre-X-15 and HYWARDS study groups concluded that "we should concentrate not on increasing L/D by every known means, but rather on seeking optimized configurations," which meant, generally speaking, much smaller wings than those called for by high-L/D designs.59 The Ames people seem to have accepted Becker's ideas with little question. Perhaps they realized by Round III that there were no quick and easy solutions to the enormous technical problems of heat protection in very high L/D design. 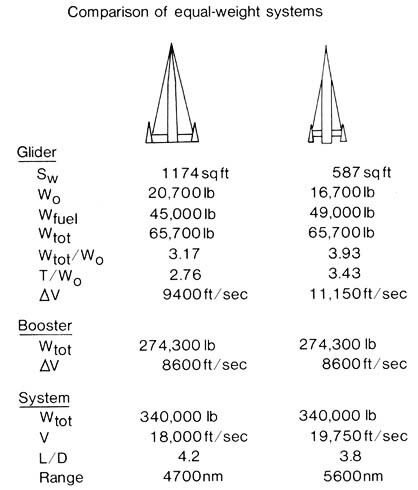 At the NACA's Round meeting at Ames laboratory in October 1957, John V. Becker used a chart like this one to show how Langley's hypersonic glider (to the right in the chart) could achieve increased range by using a smaller wing to reduce the lift-drag ratio from 4.2 to 3.8. 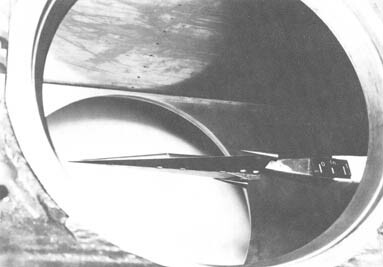 Above, a model System based on Langley's concept of a hypersonic glider was test flown on an umbilical cord inside the Full-Scale Tunnel in 1957. 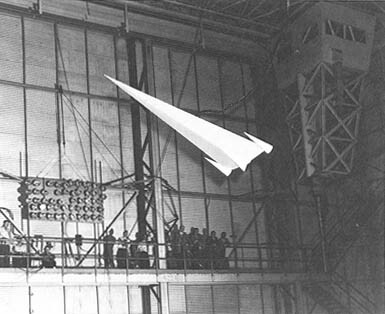 During Round III, the Ames and Langley groups studying hypersonic gliders agreed that Sputnik made satellite research a high NACA priority; the two groups disagreed sharply, however, over whether the new priority of satellites should be placed higher on the NACA research agenda than the hypersonic glider. The majority of Ames people felt that satellites deserved higher priority. They said, in effect, that since the known science and technology of very low L/D seemed to suffice for satellite reentry, the NACA should decide to work on satellites rather than on more complicated and unknown HYWARDS-type winged configurations. The majority from Langley - some of whom had argued long and hard to convince their counterparts at Ames that high LID was not needed for HYWARDS - felt that the winged glider continued to deserve higher priority. Ira Abbott of NACA headquarters, a longtime Langley employee, mediated this new Langley-Ames dispute. At the close of the Round III meeting he voiced the majority opinion that the NACA should immediately begin to study the satellite reentry problem for nonlifting or slightly lifting vehicles. It should be "in addition to continuing R&D on the boost-glide system, however, not its alternate. "62 There was good reason for the NACA to think that its work on the boost-glide system was still, in spite of the growing reaction to Sputnik, more immediate and urgent from a military point of view than was work on satellites: after all, the air force had only two months earlier proposed Project Dyna-Soar to follow the X-15 project. A revolution in public mentality was unfolding. Until the last ninety days of 1957, space had been a dirty word in American political arenas. Ira Abbott recalls that the NACA stood "as much chance of injecting itself into space activities in any real way [in the pre-Sputnik period] as an icicle had in a rocket combustion chamber." When he mentioned the possibilities of space flight to a House subcommittee in the early 1950s, Abbott was accused by one congressman of talking "science fiction. "64 Space had also had negative connotations in certain NACA quarters. The NACA had taken formal notice of space flight as early as 1952, but only as a natural extension of aerodynamic flight through the atmosphere into space and return. The predominant attitude of the Committee and leaders of its research organization during the period 1952 to 1958 was to avoid "Buck Rogers stuff." John Stack's support of the X-15, HYWARDS, and DynaSoar projects, for example, was lukewarm in comparison with his ardent enthusiasm for supersonic transport and advanced military aircraft. ********* But now, in the wake of Sputnik, space was no longer a dirty word: rather, it represented a new field of battle in the Cold War. If the U.S. lost this battle in space, many in America and Europe began to believe, the entire world was perhaps doomed to communist hegemony..
What made the NACA so confident of its ability to assume the new and expanded roles in space research brought on by Sputnik was in large measure the promising and ambitious work and bold outlook of its X-15 and HYWARDS study groups. And on no occasion was the confidence of these two groups more in evidence than at Ames in March 1958 during the opening session of the last NACA Conference on High-Speed Aerodynamics. The primary purpose of the NACA's periodic conferences on high-speed aerodynamics, begun in 1946, was to communicate the results of recent research in supersonic aircraft and guided missiles and to stimulate discussion of those results. Through the 1950s attendance ranged approximately from 200 to 500 people, about 90 percent of them from the NACA, the military, and industry, the remaining 10 percent representing other government agencies, universities, and private research and consulting firms. When the lab reopened after the Christmas holiday, Becker called on Robert Gilruth, who was coordinating Langley's conference papers, with a proposal for a paper on a winged satellite configuration. Noting that Ames researchers were quickly abandoning their winged reentry vehicle concept for new work on lifting-body satellites, Becker suggested that it was now up to Langley to provide the scientific, technological, and promotional support for winged vehicles. 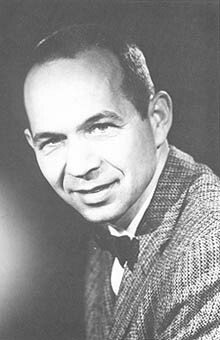 Gilruth agreed that all technical views needed airing and added that a study of a simple nonlifting satellite vehicle (which was to follow a ballistic path in reentering the atmosphere) by Max Faget, head of the Performance Aerodynamics Branch of PARD, also deserved presentation in a separate paper instead of being buried, as it was, in a general discussion of operational problems. Gilruth asked NACA headquarters if these two papers could be added to the conference agenda. Headquarters replied that the papers by Becker and Faget could be added to the agenda, and it notified Harvey Allen at Ames, who was to chair the relevant technical session, of the addition. Not wanting to be outdone, a team of Ames engineers led by Thomas J. Wong (under the conceptual direction of Al Eggers) now proposed to add a paper on their own best concept of a manned satellite - a blunt, lifting "half-cone." The organizers of the conference agreed to this third additional paper and scheduled all three for presentation early in the first session. Since it follows a ballistic path there is a minimum requirement for autopilot, guidance, or control equipment. This condition not only results in a weight saving but also eliminates the hazard of malfunction. In order to return from orbit, the ballistic reentry vehicle must properly perform only one maneuver. Maxime A. Faget was born in British Honduras in 1921, the son of an honored physician of the U.S. Public Health Service. In 1943 he earned a B.S. in mechanical engineering from Louisiana State University. After service as a navy submarine officer, he joined the Langley staff in 196 as a member of the Pilotless Aircraft Research Division. His early work for PARD involved the invention of choking inlets for ramjets and a flight Mach meter. This maneuver is the initiation of reentry by firing the retrograde rocket. Once this maneuver is completed (and from a safety standpoint alone it need not be done with a great deal of precision), the vehicle will enter the earth's atmosphere. The success of the reentry is then dependent only upon the inherent stability and structural integrity of the vehicle. 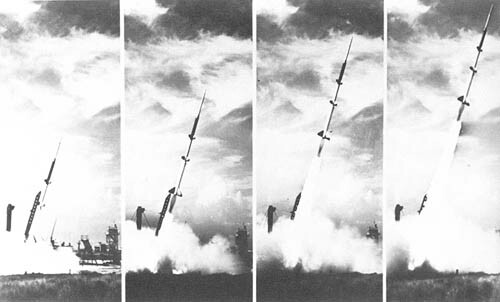 Takeoff of a five-stage missile research rocket from Wallops Island in 1957. The first two stages propelled the model to about 100,000 feet; the last three stages were fired on a descending path to simulate the reentry conditions of ballistic missiles. If they had known that in less than four months, on 16 July, Congress would pass the National Aeronautics and Space Act, dissolving the NACA and establishing NASA, the Langley engineers flying home from Ames might have thought back with satisfaction on the quality of the 46 papers they had just heard at the NACA conference. These papers had dealt with  such important new subjects as hypersonics, satellites, reentry trajectories, retrorockets, boosters, and interplanetary flight. Taken as examples of the NACA's ability to fulfill its mandated advisory and research functions, the papers suggested the ability of engineers and scientists trained in aeronautics to push their research talents into the new disciplines of aerospace and astronautics. There was no need for the returning engineers to worry about their careers being cut short. 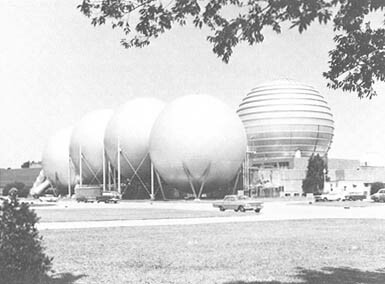 Because the NACA would serve as the nucleus for NASA, their work would change but continue. Special edition of the Langley Air Scoop, 30 September 1958, with letters praising the NACA staff for 40 years of national service. * There are three important engineering design differences between subsonic and supersonic wind tunnels. First, the test section of a supersonic tunnel is placed downstream from the narrowest part of its circuit instead of at the narrowest part, as is the case in a subsonic tunnel. Second, supersonic tunnels require powerful multistage compressors capable of increasing air pressure very dramatically in order to compensate for the large energy losses in the air circuit. Third, the air inside the circuit of a supersonic tunnel must be kept cleaner, that is, freer from oil, dust, and water vapor. See Donald D. Baals and William R. Conies, Wind Tunnels of NASA, NASA SP-440 (Washington, 1981), pp. 49-50. ** This was a more radical version of the expanding nozzle principle - which was the physical basis for originally achieving supersonic flow in a large wind tunnel. The energy pumped into a tunnel's airstream by a powerful multistage compressor, and stored in the forms of compression and heat energy, was converted thermodynamically to kinetic energy by the severe constriction and then sudden expansion of a tunnel's circuit. This conversion produced supersonic flow once the airstream had passed the point of smallest cross-sectional area. To provide for a range of teat airspeeds, engineers designed the nozzle so that its shape could be varied systematically. Since the development of large supersonic tunnels in the 1940s, they have done this by using such things as interchangeable block nozzles and flexible nozzle walls. See Baals and Corlias, Wind Tunnels of NASA, pp. 50-52. *** McLellan had outlined the findings of his original study in an "Investigation of the Aerodynamic Characteristics of Wings arid Bodies at a Mach Number of 6.9," a paper he presented at an NACA conference on supersonic aerodynamics held at Ames laboratory in early 1950. A version of this paper appeared in the October 1951 edition of the Journal of the Aeronautical Sciences (vol. 18, no. 10, pp. 641-48). **** Downwash is a small velocity component in the downward direction which is associated with the production of lift, as well as a small component of drag. At hypersonic speed, the flow behind a wing is characterized by a shock pattern. Immediately behind the shock is a region of high dynamic pressure and high downwash which intersected the lower tail surfaces of the original X-tail concept. (The upper tails were in a region of low dynamic pressure and low downwash.) This situation had the adverse effect of greatly increasing the yaw (or side-to-side movement) of the lower tails relative to the upper tails, causing directional instability. See Charles H. McLellan, "A Method for Increasing the Effectiveness of Stabilizing Surfaces at High Supersonic Mach Numbers," NACA RM L54F21, Aug. 1954. ***** Members of the HYWARDS study group at Langley were: John Becker, chairman (also leader of the heating analysis subgroup); Max Faget, propulsion and configuration; L. Sternfield and Frederick Bailey, stability, control, and piloting; Israel Taback, instrumentation, range, and navigation; Roger Anderson and Paul Purser, structures and materials; Philip Donely, loads and flutter; A. Vogeley, operations and X-15 coordination; Peter Korycinski, heating. As the work progressed, a number of other specialists were added, notably: Paul Hill, configuration and propulsion; and Eugene Love and Mitchel Bertram, configuration, aerodynamics, stability, and control. ****** Since the ratio of drag to lift (D/L) is expressed in very small fractions, it is customary to plot the reciprocal of D/L (i.e., that by which the given quantity is multiplied to produce unity; as, the reciprocal of z is 1/z) instead of D/L itself. This reciprocal, the lift-drag ratio (L/D), is commonly called "L over D." Typically, the shape of the L/D curve is such that its maximum value occurs at the same angle of attack as where the D/L curve has its minimum value. ******* The other members of the Ames study group included Robert Crane, Glen Goodwin, and Lawrence Clousing. ******** Two months before the Round III meeting at Ames, Becker and Korycinski had initiated a systematic parametric analysis of the coolant requirements of the Langley glider. 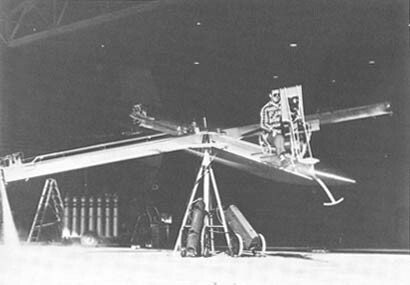 Preliminary results were very exciting, for they indicated that if the glider employed a flat-bottomed wing designed for a particular loading and maximum lift, and if the glider were then operated at a specific high angle of attack (about 45 degrees) to produce a specific reentry attitude, the need for surface coolant would be virtually eliminated. This conclusion - which was reported in a 1959 confidential paper (see Becker and Korycinski, "The Surface Coolant Requirements of Hypersonic Gliders," NASA Memo. Rpt. 1-29-59L, April 1959) - eventually helped to make it possible to design the metallic DS-1 vehicle of the Dyna-Soar Project without skin coolant. The space shuttle enjoys the same privilege because of its advanced ceramic tiles (see P. A. Cooper and P. F. Holloway, "The Shuttle Tile Story," Aeronautics and Astronautics, Jan. 1981, 19:24-34). ********* Stack resisted the space technology revolution long after the Sputnik crisis, probably because it threatened to drain away precious resources from aeronautical programs. In the early 1960s he told his colleagues that he did not buy the "to-the-moon-by-noon" stuff. After noting the enormous sizes of the Apollo rocket boosters ("like the Washington monument"), Stack (who in November 1961 was appointed director of aeronautical research in the Office of Advanced Research and Technology at NASA headquarters) tried to persuade NASA to find a viable air-breathing, aircraft-like launch system. In June 1962 he left his high-level NASA post to become vice-president of Republic Aviation Corporation, where he could continue to work almost purely on aeronautical projects.